It is 1 April 1974, and time for the final episode of Colditz. The American and Russian armies are both storming through Germany, as the prisoners-of-war in Colditz Castle wait to discover what happens first: rescue or execution at the hands of the SS. 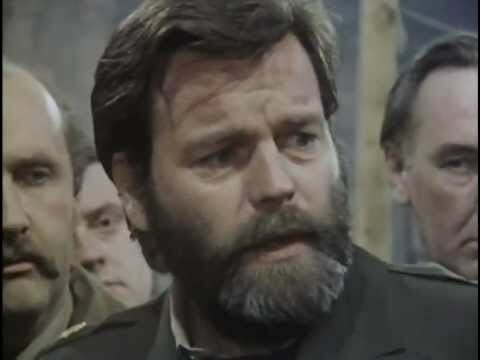 The Kommandant (Bernard Hepton) recognises that, regardless of which army reaches the castle first, his time in command is over, and begins arrangements to transfer control to Colonel Preston (Jack Hedley) and Colonel Dodd (Dan O'Herlihy). After 28 episodes and two seasons, Colditz comes to a conclusion with this straight-forward and hugely dignified final act. Truth be told, there is not a huge amount of suspense to be found here. We know from history that Colditz was liberated, and that its prisoners were successfully rescued by the United States Army. The focus here is not the 'how' of the story, but rather on the effect the events have on the characters we have been watching for the past two seasons. When the Americans liberate the camp it comes with a range of reactions, from joy to just a sheer overflowing of emotion. Preston is quietly elated. Lieutenant Carter (David McCallum), a constant presence throughout the series, just seems overwhelmed. It all feels realistic and deeply satisfying. It avoids over-the-top hyperbole, and simply provides the audience with realism. That has really been a hallmark of the series from the beginning, and one of the reasons it has been so satisfying to watch. The BBC would follow up on Colditz with several other World War II dramas, notably Gerard Glaister's 1977 series Secret Army and Lavinia Warner's 1981 internment series Tenko. They all tended to follow the model created here: nothing flashy, and nothing over-the-top. Just beautifully scripted and well-performed stories based on history and focused on finely crafted and believable characters.